Submit material to us via e-mail at this address: altro.editor@gmail.com. We will only reply to those who contact us with full info - full name, e-mail address and phone number with whatever comments or questions you have. Expect a reply within 48 hours or in some special cases, a full week but never over two weeks. We will either call or e-mail you back. Thank you for your interest in our publication. When we bring on a new ad client, it is fully explained to client how our policies work as they have been verbally instructed to read all of our policies here within this site, both in this SUBMISSIONS GUIDELINES section and in any e-mail correspondences we have made with our prospects and clients. This includes receipts and/or other marketing material we may send client. However, we also make a special note that regardless of what papers or documents cross between us and our clients via e-mail, our website here on this page is to be referred to as THE FINAL WORD and will be referenced back to as our main policy page for our STANDARD PROCEDURES for all we do in our business practices. We also maintain phone recording records with our clients for oral/ verbal agreements for quality control purposes, as this helps us to stay clear in all of our communications. We always encourage customer cooperation by having customer/ client be fully informed about how we work with them. This is always a CLIENT'S RESPONSIBILITY to always make themselves aware of all info related to their ad campaign with us, from the beginning of our communications with them when a client is an 'ad prospect' all the way to when a prospect becomes an 'ad purchaser' and gives us their payment or payment info and is now considered an 'ad client'. Unless we are conducting a live phone-recorded interview at the client's request and the client has authorized us to copy and paste any info (including images) from their website, each client is responsible for sending us their ad promo material. Most clients wish for us to use some of their material from their website, despite whether we add our own info too. This is just a typical request from most of our clients, so we tend to incorporate that info from any online links of the company, and we are glad to honor this request for our clients. This material may come in any form - whether that be through postal mail, and/or their own writing via e-mail (where they are sent a Question form/ Questionnaire by us) and they then are responsible to send back to us their own replies via e-mail within two weeks and are also responsible for proofreading and giving us approval for running their ad. The ad fee, however, is never contingent upon the final result of an ad. Fees are always paid upfront at time of ad purchase and at time of auto-renewals. If changes or modifications must be made to the ad content, this is what our edit rotation system is put in place for, as we are fully prepared to accommodate client's content changes or any updates they have in order for us to have all of the facts straight and the contact info correct. As of the spring of 2013, we have made it official that we now also send out a Proofreading Check list document if requested by the ad client - with the final copy to review, in order for the advertiser to work within a certain set of guidelines that makes the proofreading process easier,as well as more convenient and effective. We send out this check list ONLY when a client has requested a business profile sheet to fill out and has made such a request in writing. When the editing guidelines are followed, the final approved copy of ad page will be published live to the site much quicker in its move in the queue, evolving from 'under proof process' to 'final live publishing'. It is the client's option, however, to request a phone interview, and we can do that as well - where we ask the client a variety of questions and record the call for quality control purposes (as we do all of our calls) and in doing so, it is up to our team of writers to take the interview notes and write an 'advertorial'. Usually, our editor/ owner will take on this task and will do so with quite pleasing results. 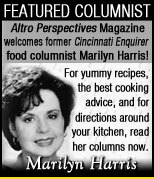 Our editor has written for many local and regional publications, including The Kentucky Post, The Cincinnati Enquirer, the Recorder Newspapers, Antenna, former Everybody's News and many others. Your ad material is in more than capable hands! If a client chooses to send us back their own info (in the form of other material they already have) or info from our Business Profile Sheet (our Q and A list we send them by their request) to provide us with ad info this way, then we wait for them to return that info to us. If we do not hear back from client after a few weeks, we will only be able to publish their basic info online (which means website links and contact info along with a brief tagline if we see that info in an online link) until they can get us back more detailed, outlined info for the next quarter period or that next year. It is important to note that we have other clients to serve as well and it is not our responsibility to continue contacting a client to provide us with their ad material. We honor and uphold all clients being proactive and courteous in this way and making it conducive for us to serve all of our clients. Also, client agrees to send us all of their ad material/ info in the manner in which we request it which involves knowing our technological specs and formats, etc., and that specific spec-tech info may change from time to time but currently, we ask that a client send us back their replies to the Q and A form from our word doc by applying answers directly into that space inside our doc we send you. Please do not rename the file or send it back to us another way or via another file. Or, another alternative is that you may send it as a 'copy and paste' method inside the body of the e-mail. To keep it more organized, we ask that client lists the number of the Q above their answer so that we may know how their answer is referring back to and relating to one specific question from the list. Client does not have to reply to all questions, but may choose a few select ones more pertinent to their promotional ideas and needs. Never send info to us outside of these technological instructions and boundaries unless we mutually agree to a new communication format prior to any sending of ad material. Also note, that any new agreement or other ad campaigns falling outside of the ad program and these stipulations listed here in this site or outside of the original ad program client agreed to have us initially run, must be made jointly in writing in an e-m form for paper-trailing and for proof of our agreements. This 'other', 'new' work includes editing or writing content for a client's website or some other related project. It does not pertain to any ad pages in the online ad program that was initiated for our two-year programs where we break the full payment into two years - having a charge be pre-paid first year and the balance of that charge be paid the second year upon the 'second year automatic renewal' which we have reserved the right to debit as an electronic payment with client's check account info on file with us from their first year in the program. Images: Send images including any vector images and photos as jpg’s only and as attachments but never send as embedded links inside the body of e-mail! We also work with standard PC-systems, not Macs, as is standard and universal in the industry. Client understands that they must conform to our system's technical formatting requests, as our website is built a certain way as all websites are, and we do not conform to clients' tech specs that fall outside of the parameter of our system, as that would obviously require rebuilding our entire admin/ back-end of website for each advertiser's specific requests in that way! We are not responsible for a client's images, in that we usually do not drive out to client's place of business and take photos for client but some exceptions can be made for an extra fee and also, business must be local, within a 25 mile radius of our Ky. office if that is a client's request. The other note for web ad pages is that we usually publish/ post 1-2 photos and do not publish anymore than 3 photos at a time for a page; if more images are requested of us to post, please note there will be a $50 charge per photo upload beyond the space limit of three images (3). To keep things flowing easily and more efficiently, most companies send 1-2 photos and, most companies request of us, or give us consent to, copy and paste their images from their websites or other web pages they have online. Thank you for all your respect given our technical specs and prerequisites. Client must be aware that we are also acting within our legal rights to process any check info they give us - whether that payment be given to us as a hard copy check in person or over phone. (If we are within 25 miles or less of a business's office location and if the transit time is feasible within our schedules, as we also have other jobs; if it is not, and there are special arrangements made to meet, there will be a fuel charge to drive to meet with business/ client). Also, we ask that client pay a 50% deposit of the ad fee over the phone for electronic payment BEFORE we meet in any in-person appointments in order to secure a serious commitment to the ad program. Or, we may be paid over the phone in full without an in-person meeting - as an e-check or 'electronic check' (ACH payment) with our local bank, as most of our financial transactions are done over the phone with e-payments. We always keep our clients' payment info private for their security and that we also will be keeping that check info in our bank files and have the right to re-run and process again later for the second year's auto-renewal (unless client goes out of business or has informed us within their first 5 days of their anniversary month that they are not renewing). We never process any other fees beyond what is agreed between us and ad client. The full run/ 'full time" of an initial ad campaign is two full years, with the full price of ad being broken down into two years' payments with first payment being processed first year and second half of ad fee being debited the second year to complete the full two years, with the second year being placed in an automatic renewal system. From thereafter, (third year and following) renewals are optional to run as client may opt out of program at that time. The exception to this policy is when the client we sold the ad to in the first year contacts us the anniversary month of their purchase date the next year, and at least gives us one full week notice into that anniversary month that they are not going to renew (usually due to one of our 'emergency cancellation stipulations' that include going out of business/bankruptcy, the owner, and/or authorizer being seriously ill and/or hospitalized or deceased). If we do not hear back from the client within the first week of their anniversary month with any of these above cancellation stipulations/ exceptions, then we will proceed with planned second year or, 'second run' (or even consecutive years afterward) of the automatic renewal and run their payment with their payment info we have on file. In this protocol, we assume an auto renewal each year unless a client contacts us via e-m at least one week before or going into first week of their anniversary month. It is always an advertiser's responsibility to be proactive in updating their material or communicating with us about their ad in any way, including reaching out to us in writing to cancel an ad (with above emergencies noted) so that we may have that writing as proof of such request. If any cancellation is made by advertiser-client, they must be made in writing via e-mail and not just verbal. Verbal notes can be forgotten so an official note in provable paper-trail must be made to formally cancel an ad - at third year or after. Upon such a request, (as long as client requests a cancellation of ad within first week of their anniversary month or earlier under the above conditions/ exceptions), we will then send back the client a cancellation form that must be filled out by the owner of company so we may take care of any such cancellation procedure. If there is no cancellation request by the ad client within these time frames and under these conditions, we will assume ad client is continuing on with their ad with us, and we will send them back an e-m receipt of their payment that was processed electronically with the check info they have on file with us being debited for that annual amount due. Also note: If client has more than one ad with us, their main ad is attached to their other ads in our admin and is set up as a package. If one is cancelled or removed, they all must be removed together as they operate as a consolidated package in our system and not treated or updated as individual ad pages. This is part of how our technology works within our system to keep our IT department running more smoothly and operating more efficiently. Make note of the following: a) When an ad client renews this ad later (after your full time of the first two years or 'second run' with us expires), then you may renew for the grandfathered-in discount again for the same price you paid the first two years of your purchase order. We choose to honor customer loyalty by grandfathering in your initial rate! b) Our standard policy is that we do not offer refunds of fees under $500, unless a business shuts down permanently within 30 days of this receipt. In that case, client must send us proof in writing of such a closed business, including any bankruptcy or 'ceasing to operate' papers/documents for verification. c) Under such a circumstance of a refund like this, a $25 'kill fee' which is part of an initial processing fee will be withheld/ kept/ or debited, and the balance of ad fee is then refunded to client after client fills out the necessary document for such refund. This refund is for the cost of the ad minus the $25 fee which is kept by us as a processing fee for taking the order and setting up the ad, which may include, but not limited to, running a verbal recording regarding the ad update for oral/ verbal receipt purposes, registering/ filing an order number for ad, sending any written receipts along with client's order number, and for any possible uploading to the client's ad page the necessary meta tags/key words for Google SEO, etc. The kill fee also applies to anyone who wishes not to renew on their third year or after. We must debit a final settlement to 'kill the ad' as there is time that must be allotted to remove the ad and to remove any meta tags/ key SEO phrases in Google. Basically, the campaign is being ceased/ canceled, and the final cancellation fee of $25 will be owed and e-debited from the account number of client's we have on file. No other fees will ever be debited after this (unless the client returned later for a new ad and that would initiate a whole new agreement and campaign - the new ad then reverting back to a first and second renewal commitment, etc). 'Kill fees' in reverse: Part of the reason for the cancellation fee is for us to compensate for not billing a standard processing fee that most advertising and marketing companies charge in the beginning of most ad campaigns. Initially, we do not charge 'set up' fees for building the ad; however, since we don't charge for processing the ad, we must ensure that compensatory and minimal fee of only $25 to our IT department for all the work they originally did in the beginning of the campaign, which includes the reversal of setting up the ad, as now they will be removing the ad, and taking down its page, its links to Google and SEO program, etc. This also will cover the original set-up fees that we did not charge in the beginning of the ad campaign. If a client has more than one ad with us, both ads or all ads are connected to one another in the back-end of our site/ in the admin. In this way, the main ad page that was purchased first must be renewed - even after the second yr auto renewal due to how the ads are linked to and cross-over with the other one in regard to our coding and linking between the ads. If your ads are purchased or renewed within 6 mos of each other, a refund or an option to cancel either ad is not open to act upon, simply due to the secondary ads not having a full year to be viewed. If however, the main ad page is up for renewal when the other ad or ads have already been in the magazine for a year, the main ad page may be canceled if it has fulfilled its 2nd yr auto renewal and is going into its third year or later. Also note: Traffic reports and all other update info/ update material made in following years, made between renewal times, are not contingent upon renewals for second year. Marketing online is a process, not a one-time event, hence why we make it a policy to enforce the auto mandatory second-year renewal. Once the payment on file has been processed, a receipt is then e-mailed to ad client/ recipient and following will be a traffic report and update requests made by client will be honored at that time if they wish to update their ad page. Third years and consecutive years, the renewals are not mandatory but are automatic, in that - if a client wishes to cancel ad program, they may opt out on their third year or later years, but if so, must do so in writing via e-m. That cancellation request sent to us via e-mail may be requested a whole year ahead of their third (or next) year, (even right after the second year renewal) but must be made known to us at least the first week into the anniversary month of their renewal. If ad client misses that deadline, the payment on file is processed 'automatically' at that anniversary time with no refunds for that year. Once a check has been verified from client and that the account is still open, if the client wishes for another check to be used to settle the payment after they have paid us with the first check/ payment, and the ach/ auto draft has already been processed, we do not credit back the payment and take a new payment from the client. Instead, we expect for client to reimburse their other account or account holder instead of reissuing and processing new payment info with us, as new transactions such as this will incur a cost on us that we would have to pass on to the client. Client must be responsible for updating us with any new payment info or any other new info, including e-mail address updates or changes in their ad, such as moving to a new location and changing their physical address as well. Client must also keep their anniversary month scheduled in their own calendars and be responsible for their own deadlines as we do not have a department that handles constant e-mail reminders to those who do not keep track of their ad/ marketing programs. We tried to run a system for that in the past but later decided to cease it due to how it is very time-consuming and cost-prohibitive, especially given how low we charge for our ads; even at our regular annual rates of btw. $699-799, we are offering a discount in a competitive industry where not only corp. companies, but mid-size marketing companies are also charging these kinds of rates MONTHLY, not yearly. As a small company ourselves, we take great pride in offering and reserving our ad/marketing services to only those companies who are independently run and operated instead of running ads for corporate America where, unfortunately, too often profit is placed as a priority over people and consolidations and mergers are taking over the independent marketplace. As a loyal homage to our local merchants and smaller businesses in the small-business-focused communities, we take a different route to supporting others and ourselves. We hope our clients do appreciate that. In the renewal process - both in second years and consecutive ones, if advertiser chooses to stay with us third year or after - we typically e-mail the client their official order number along with a receipt to follow after the electronic payment has been processed/ transferred. Time of renewal begins then at that time of e-mail notification and receipt sent to client. There is no waiting process necessary for us to hear back from client at that time, (unless they contact us immediately for updates) or unless there is a change such as emergency situations such as the ones listed in this policy section (such as a company going out of business or owner/ authorizer of ad passing away as 'deceased', etc). Also, if updates are not sent to us or made known to us via phone within two weeks from renewal receipt, we do not post updates. The client may then later send updates at the next quarter period but must do so at their own calendar marking, as we have made these policies and timelines/ deadlines clear in all of our writing - here in this site and in the client's receipt. Duration of ad time: Ad cycle of the year begins the month of the ad being paid for. Once a payment has been sufficiently processed and at time of that receipt, that month begins the year. That year ends that next year's same month so - if you come on board in June, then the next year's June will be the ad's anniversary month to complete that year. We no longer wait for ad copy to be 'live' on our site to officially begin the time line of ad program's year or beginning of time frame with us. We've waited for some clients for months (!) before they would approve of ad copy or submit us the material they informed us they'd send. If ad client wastes their ad program's time, this is not time we can grant back or stretch the ad program year or time frame to compensate for lost time. Again, we do our part that client pays us to do (the writing and/or editing/ posting ad copy and contact info live to our site, marketing, etc, and we also send out traffic reports annually and at 6 mos intervals when requested). However, we strongly advise that our clients be responsible for their own ad programs when it comes to making and allowing for electronic payments to be processed that we have on file after first year, sending us ad material copy and image/ photo submissions, calendar notifications of when they need to send info to us and other such duties as any responsible company or entrepreneur will usually know to take care of. Client also will note that they are to be responsible for ONLY their ad program and no one else's. This means that if client has referred us to another business that also purchased an ad page from us, client acknowledges that we do not run interference or communicate for other clients through another client, whether they be a friend, relative or any kind of referral. The result of their ad campaign is NOT relevant to yours and vise-versa. Everyone's business is unique to them and results are individual to each one and should not be relied on as what your results will be. We do not honor a tribalism paradigm/ rationale in this way as this is a logcial fallacy that should not be followed. No one decision maker for one company shall speak for another company they do not run or own under our policies, regardless of their circumstances or how they came into the ad program. We also apply this policy to those within the same company of one ad program, so if a key decision maker or owner purchases the ad for that company, only that person and/or the owner (if they are one in the same or one or the other) can speak to us about that company's ad. No other person or board or counsel within that company may speak for, authorize or make decisions for that company unless an owner or decision maker has taken ill or become deceased. Under that condition, when the original/ initial authorizer for ad has left their position, the new person who has stepped in to take the authority or position of the first contact person we do business with will be our new 'point-person' to contact for the ad or the updating of the ad. When that new person steps in to take over last ad purchaser's position, they inherit the ad campaign and are obligated to carry out the program as we originally set up for past authorizer of ad. He or she must validate our policies by receiving our e-mails and/or verbally agreeing to accept our receipts (and receipts are used for proof of payment), and this new 'point person' shall be listed in our files as the one accepting responsibility for the ad program from that point forward. Special notes on someone quitting their job or being deceased: If an original authorizer for the ad has quit their job, or left the company for another reason, including becoming deceased, the new person filling that job is the one we conduct our business with and that new appointed representative will be acting as a new authorizer and steps taken to set up a new ad page with new info, along with this now being considered the company's first official year under the new leadership go-to person, who stands in for this ad, will be the one we begin a whole new ad program with. If this authorizer is only temporarily ill or absent for some reason, and has not quit the job and left the company or has not become deceased, then the next-rep-in-line to fill in for them during their absence is the one to take care of the ad campaign with us. Under this type of a circumstance, this new authority beneath the owner or initial purchaser of ad must step in for the remainder of the ad program regarding any of its decisions or updates to the ad page. When others within or even outside of a company speak for the one who authorized and paid for the ad, including an accountant or a board or committee, this is not viewed as a stable, professional or reliable way to conduct business. We will only communicate with any client who is known to us as the "ad purchaser" and/or "ad validator" who usually is the owner or the owner's marketing representative or can also be an assistant director, VP or other such title that makes them be responsible for 'filling in for' the original authorizer who may be absent for a time including a second year renewal. This person is the one who accepts our receipts from our one-on-one phone recorded call to conduct any business. To be clear: when the current authorizer of ad tells us they will accept our receipt e-mailed to them, (including this present authorizer who is filling in for the original authorizer from previous year), this is clear they are accepting the fee transaction of the e-check debit being made - otherwise, there would be no need to send a 'RECEIPT'. We will only take this person's direct word for any authorizations or all communications concerning their ad. Under no circumstances do we accept or allow for any of our ad clients to speak for any other of our ad clients or anyone else who is not "authorized as purchaser of ad" or who is not "authorized as second in command/ assistant to" authorizer or anyone who is filling in for the owner, director, or original authorizer of first ad year to conduct business with us. This means, if the original authorizer of the first year with us inherited the ad from another prior authorizer who left the business and it is their responsibility now, they or their assistants/ one who fills in for them in their absence due to any illness or such, is the one who is responsible for authorizing payment and conducting any updates to our page we have with this company for their second year. Thank you for understanding this imperative policy that we must enforce at all time. Also note that once an authorizer has spoken for their company to inform us about their updates for their next year's renewal/ updates and they have accepted verbally in our recordings to send their receipt to a specific e-mail and they have provided us that e-mail address, etc., this arrangement cannot be cancelled or taken back/ revoked. In other words, if the authorizer is recorded in our phone records as verbally stating that they are accepting their receipt (and after we have asked them to validate their e-mail address or addresses we have on file, to send their receipt to), that is considered the final authorized statement of ad renewal and that e-m address is the one we will be sending our info and receipts to for that person's records/ files. REITERATED POLICIES FOR 'AFTER THE FACT' authorizers: In no way do we accept the authorizer we have had on file to take care of the renewal process and then come back later, after they have accepted their ad page and stated any renewal info with us, to cancel the authorization and inform us that someone else must authorize instead 'after the fact'. Once an authorization has been recorded verbally of go-to authorizer's e-mail address they verified or provided to us, and they are accepting their receipt for their electronic debit, etc., and esp. given any further info being shared with us such as updated info the authorizer has provided us, including new e-mail addresses to send our info to, and all of that has been telephone-recorded, this means a full authorization process has been conducted, and it stands as the final agreement of authorization and cannot be immediately 'switched' over to another authorizer later, 'after the fact' for any reason. Editing ad page for the second year renewal: To reiterate: Only the person who approved of ad and gave us their 'green light' to post their ad to our site can be responsible for updates or for any and all communication between us and them. We believe in being as streamlined and organized as possible. On updates per auto second renewal year: Some clients decide to leave their ad page 'as is' and others wish to update it for the second year. If there are edits requested of us, and once the auto-renewal is underway, the client may send us updated info, as mentioned above, and may also send us any edits they want their page to reflect that are requested of us to make for the new second year, aka, 'second run' ad campaign. Note, however, that the auto-renewal fee must be pre-paid as it is in the first year (debited by us electronically with check info on file) and that any material appearing in the ad page is not conducive to being 'approved' or not accepted, etc. first before we secure and process payment by the client; in other words, these two events are not relevant to each other. The ad's changes/ edits are not contingent upon us being paid or not. This is what the editing process is for - we guarantee that we will take care of any updates/ edits or modifications to the ad page once we have processed the auto payment for second year auto renewal. Client may send us new links to websites or social media link pages, etc., or new photos to replace older ones we used the prior year. Photos must be sent in jpg format. Further elaboration on second year renewal: If a client has forgotten what their page looks like and can't recall the information they supplied to us the year before, upon client's request, we can send that link of the ad page first to familiarize them with their ad material and then we will process the payment immediately after the page has been sent as their reminder of what material they are to review for the year, but the editing process follows the e-payment being debited/ processed as this is an 'automatic second year renewal' and therefore, payment must be paid and at this time. One of the reasons for this policy is to ensure payment at a certain time to keep our accounting system as well as our art department's ad queue streamlined month to month and some clients have been known to take a great amount of time to get edits or info back to us. These are basic, standard procedures for all automatic second year/ second run renewals. Also, if the authorizer or authorizer's stand-in during their absence is taking care of this ad page with us, they may send their page to their graphics department or others in the company for any updates they wish to implement for us to do but this is a separate involvement within the company as this part of our ad client's company is NOT responsible for any other authorizations - esp. that of payments, etc., as they may ONLY update any changes or edits for us on an artistic level, but within our above guidelines - with new photos sent to us as jpg's, etc., and the authorizer or fill-in authorizer acts as the liaison between us and their art/ graphics department if they are using a different department of their company to work with the ad page's updates or edits. Notes on free time if any such free/ bonus time on an ad is applicable: Sometimes under certain specials, an extra month or two may be added to an ad campaign's time; however, most times, it does not apply. If it is written in your receipt that we are offering any free/ extra time to your ad time you purchased with us, that free time does not fall in the first year, but is added on at the end of the two year cycle/ lifespan of ad, which will occur after the second year automatic renewal time expires. Other policies include that we will re-run/re-process a payment in our files if there is an ISF or ANY ACH returns, especially after an ad client has confirmed with us verbally on our recorded calls that they are renewing, etc. and that they have verified their account number/ info with us for a debit to be withdrawn. In our phone logs, a verbal recording acts as another form of receipt and can stand alone even stronger than a written agreement. As is standard with most companies' policies, there is also an ISF fee of $30 if we receive a check payment that is returned for insufficient funds. If we must re-run/ re-debit an account for any ACH returns, after the first re-processing of payment, there will be a $6.00 transaction fee for anymore processing going into a second re-run of payment and thereafter. Within our banking policies with our local bank in Kentucky, we also do not issue refunds after an ACH payment/ e-debit has been taken with the above-mentioned authorizer or authorized 'assistant' for authorizer if authorizer is absent, ill, or deceased - has given us their authority, approval or verification of info to run payment. If a return comes back to us, we have the right to withdraw (re-run/ re-process, etc) the ad fee once again to settle the payment. See above paragraph for all the other details regarding ACH debits. Some have asked us, "Do I need an actual tangible check to have you run an ach/ e-check?" The answer is simply "no." We run your checking info via phone as a 'check by phone', also known as 'e-check'. So, in this way, we only need your routing and account numbers and name on the check for i.d. purposes to run your payment electronically. This is it! You don't have to worry about issuing an actual check out to us. If you don't have your acct # memorized, or your checkbook handy at time of sale closing when we begin to process your order, all you would need to do would be to call your bank and ask them for your account #. By simply telling us the name of your bank, we can easily identify your routing # as most state banks issue ALL of their customers the same routing number. After payment is processed, we always send back an e-m receipt and also in that receipt will be a link to this policy page here where you can have access to the FULL DETAILS of all of our policies anytime. *Final notes - ISF's and Re-processing Payments for settlement of ad fees owed and Fair/ Equality treatment of all ad clients: If we would ever have to re-process your payment, there will be a standard $30 ISF fee you will be electronically charged/ debited by our bank as well as a $2 charge for a new re-debiting. If we were still not able to collect on the fee owed after two failed attempts to collect any unpaid money still owed, our policy states that at that point, as a last resort, we would turn over all info to our legal team and they would contact you at that time. If any legal fees were charged, we would pass that on to the ad client as client would also be responsible for paying such. This in no way is a common practice and is not usually necessary to employ these kinds of policies, but we have unfortunately had to take care of these matters this way in a couple of isolated past incidences and though we don't like doing so, we are a professional company that works on principles and not what is merely convenient. Prices and time frames of ads subject to change any time without notice with changes often due to what market bears and to other possible fiduciary facets of pricing matrix that may need to be adjusted to reflect our costs in running the online magazine. The basic two-year annual renewals may be subject to change to be broken down from once-per-year charges into six-month intervals with renewals being set up every six months as we debit client's payment on file every six months. We still honor our discounted rates, however, especially for loyal clients who have been with us longer than two years. Although this doubles the price per year, we still honor our low 'set' price point client comes in under and do not charge monthly or even quarterly rates at this time as most of our competitors and other media and ad agencies do. We also do not treat any clients unfairly or differently based on any social politics or favoritism, including race, ethnicity, age, religion, gender or any other specificity beyond what is basic common courtesy and simple human respect, which we present to all people in all companies we interact with. Writers need to send two articles or work to us in the body of the e-mail only. We do not accept attachments at this time, unless we know you personally or the source from which the material is deriving. Note this is only a safety feature to protect against any potential viruses or unclean files. Writers need to submit work that has been published before and must accompany a brief bio sheet or resume. Send in body of e-m in sections or send in separate e-mails consecutively. If you have won any awards or special recognition, please include that info as well. Please send any links to resumes or other work that may be linked to any website or blog. Send us any info about things we are interested in - see all of our topics and departments inside this magazine for reference. We especially need stories now about feral cats, home improvement, alternative health, music and entertainment (but not shallow celeb pieces), and anything related to spiritual or metaphysical interests. Our views may not necessarily reflect those of the writers or our readers, but we like to offer fair and honest journalism, so make sure your work can show us the balanced 'perspective' of both sides of any issue - esp. if there is a controversy surrounding the topic. Always be willing to supply us with your sources and your interview subjects if we ask for them. Plagiarism and using fake references or names in a story is immediate grounds for dismissal and any pay owed to writer at that time will be subjected to being withheld or suspended. We DO NOT accept any info about shallow, petty gossip or trivial, 'glossy', 'plastic' entertainment stories. No celeb 'junk' stories about who someone is dating or divorcing, or any such fluffy, banal, unimportant news. If a talented, note-worthy celeb is doing a charity or fundraiser or is making a well-crafted film or releasing an album of topical and/or cultural significance that has something to say and is artistically executed, we want to know about it! If it is news-worthy, we will consider it. Please don't send any stories on 'celebrity sightings' or silly, non-celebrity news such as reality shows' news or so-called 'reality stars'. Despite what pop culture suggests, we not hold the belief that these 'TV personalities' are "stars" nor do they represent any such talent or pay homage or respect to any craft or skill in the entertainment business and we DO NOT wish to represent or support such triviality. This is not to say that reality performers are not considered valuable, as we can acknowledge and even accept that they are, and we also note that they certainly have shifted media trends (for better and for worse) but just not acceptable to Altro's standards for our news-focus. Thank you for understanding. Not to say that we don't appreciate the humorous, as we support all kinds of humor as well - dark/ satire, silly/slapstick and other types in between. This is to say that if you know someone you would like to present to us who is an actor or comedian of great talent, we will consider such press releases along these prerequisites. But is the humor witty, topical, sophisticated, original, and does it have a subtext where it is trying to say something more important or interesting than just offer a laugh? If so, that is the highest caliber of humor and we welcome any news about that, so please forward our way! If the humor is attacking minorities using racial epithets or is abusive to others in a slanderous way or is not timely (i.e., jokes about 911 right after a tragedy like this, etc.) we will not use those stories or publish news about those types of projects or events. We also will not consider general film reviews or film news such as overdone action summer blockbuster 'hits' with too many ridiculous car chase scenes and special effects, monotonous, unoriginal rom-coms (romantic comedies) or 'girl-next-door' comedies as high-quality art or of high interest. In other words, we do not pander to the status quo of the juvenile tastes of the unsophisticated mainstream culture that exists today. We here at Altro are all about creating a NEW MAINSTREAM - turning the banal convention on its ear, completely rendering the typical, sub-standards and unimaginative stereotypes negated and abandoned for something more creative, more provocative, more honest and genuine to take its place. We are doing all we can to return to the real vehicles of yesterday with a new set of wheels to ride along on today. We often wonder here at Altro, why is there not a new revolution taking place such as back in the hippies' Vietnam era? (Note: not 'hipster's today era). Or the old Walter Conchrite and Dan Rather/ Peter Jennings journalism times? Or the high-end, artistically challenging days of Andy Warhol...? Maybe we can start a new time! We need this kind of thinking, especially now that we are stuck in such a culture crisis! We need daring innovators to take on a rebellious revolt that will plow against the banal and boring, dumbed-down media circus where narcissism has taken over social media and the thinking of untalented simpletons has taken over our collective common sense that unfortunately exists now In American culture. If your brain ticks anything remotely like ours, we probably will want to get to know you and your material, so send us the brave, the original, the unique, the intelligent, 'the individual', independent news that doesn't apply to hipster mentalities. We send our gratitude out to you ahead of your submission(s)! Note that material sent to us of any news-worthy nature does not have to include known celebrities. You may send us news about your favorite local or regional heroes, or anyone of integrity on social media or of any up-and-coming talents/artists or those who are known as independents - 'underground', 'best-kept secrets'. Ironically, the underground is where the truth and real art lives and thrives and we believe in giving it the sunshine it deserves instead of leaving it behind in the darkness or 'thrown in the shade' as the myopic and avaricious mainstream media tends to treat this kind of news. ATTENTION ALL OTHER ARTISTS, BUSINESS ENTREPRENEURS & PIONEERS - GRAPHIC DESIGNERS, PHOTOGRAPHERS, SALES AGENTS, ETC. : Please follow all of the above guidelines and contact us via e-mail at the first paragraph above and we will respond to your query as soon as we are able. Please be patient with us as we typically receive many weekly e-mails and may not be able to respond right away. Allowing for a reply within one to two weeks is most realistic. Thanks for your interest and ingenuity. Here's to passionate ambition and creative empowerment!